Lit: A Memoir (P.S.) http://rcm.amazon.com/e/cm?t=cherrybloss03-20&o=1&p=8&l=bpl&asins=0060596996&fc1=000000&IS2=1&lt1=_blank&m=amazon&lc1=0000FF&bc1=000000&bg1=FFFFFF&f=ifr I had a great time with the extended family over the holiday. It’s sad not seeing people you love very often, so when I can I soak them up and savor them as though they were gravy. The last day of our visit my sister and I noticed we hadn’t had time to try out the basketball hoop Dad got for his birthday –how many senior folks get a hoop for a present! 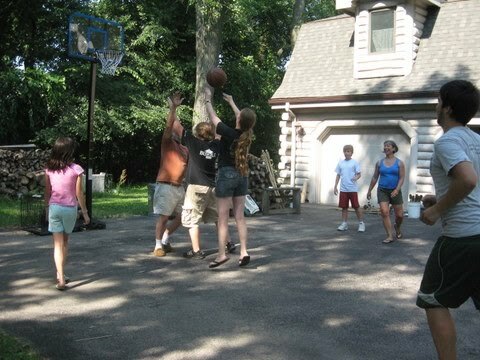 My sister and nephew and I, plus Dad, practiced shooting wild air balls and inept rim shots, but soon progressed to guarding and blocking with lots of laughter. Going inside for my camera, I tried recruiting the others who excused they weren’t any good. “What, you think we are? We’re just having fun!” brought some of the kids outside. “I’m just watching,” became playing and we had a crazy game going, laughing and cheering each other on. It was worth the sweat. Recently I heard the saying, “Perfectionism is paying too much attention to failure.” There’s also, “Perfect is the enemy of good.” A lot of writers struggle with creating the perfect sentence, the perfect book. Mary Karr, author of the bestselling memoir, Lit, says she threw out about 2,000 pages and still thinks her book isn’t good enough. So for the average non-writing person, penning a memoir or life stories for the family can seem like a swim across an ocean. Or being asked to play on a basketball team. But don’t worry. Family members don’t expect you to be an expert at writing or storytelling. Ask for help, do your best and have fun. It will be worth the sweat. This entry was posted in writing skills. Bookmark the permalink.